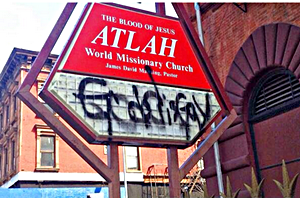 Harlem "Stone The Gays" Sign Pastor: Mean Gay Bullies Vandalized My Sign! Home/Featured/Harlem “Stone The Gays” Sign Pastor: Mean Gay Bullies Vandalized My Sign! Remember that TAX FREE CHURCH which advocated violence against other living beings did not pay a nickle for the seven hour investigation. This is not how to behave. Now this guy gets to play the victim. And the pastor knows the vandal was gay because …?